1 apr 2017 - Wat verstaan we precies onder ‘innovation district’? In verschillende steden wordt de term toegepast als veelbelovende strategie om productieve, inclusieve en duurzame gebiedsontwikkeling te verwezenlijken, maar in de praktijk stuit men op onbedoelde neveneffecten zoals gentrificatie. Het is daarom de vraag of in welke gebieden een ‘innovation district’ toegepast zou kunnen worden. Flavia Curvelo Magdaniel, gepromoveerd aan de TU Delft, wijst op de mens als essentiële factor voor een productief en welvarend ‘innovation district’. In their ambition to remain competitive in today’s knowledge economy, Dutch municipalities may be choosing a controversial approach to develop urban areas so-called ‘Innovation districts’. These are ‘geographic areas where leading-edge anchor institutions and companies cluster and connect with start-ups, business incubators, and accelerators’ (Katz and Wagner, 2014). This report described the ‘rise of innovation districts’ as a ‘metropolitan revolution’ embracing the city as the natural environment for innovation compared with suburban developments. Their concept, exemplified with American cases, has influenced urban development practices worldwide. Just one year after the release of this report, several American cities have launched their ‘innovation district strategy’ to spur economic growth (e.g. Detroit, Miami, Chicago, Fremont, Minneapolis and Boston). Three years after, this term seems to be ringing the bell of municipalities in the European context: Rotterdam, The Hague, Barcelona, and Manchester began labelling urban developments as ‘innovation districts’. What is interesting about innovation districts is that, in theory, they have the potential to spur productive, inclusive and sustainable growth. In reality, developing innovation districts is an urban strategy used to support both, economic and social goals, in which gentrification issues such as the displacement of residents may be an obvious outcome. Herein, there is a lack of understanding on what makes innovation districts productive and prosperous: people. So you think you have an innovation district? The challenge of developing inclusive innovation districts was the focus of a debate held at the Great books session organised by the Master City Developer on 13 February 2017. With the catching title ‘So you think you have an innovation district?’ this meeting brought together the viewpoints of scholars, practitioners and municipal officers, who enriched the discussion about how innovation is being used as top-down strategy to improve ‘particular’ urban areas. Yet, the question remains: why focusing on planning certain areas while neglecting others that may have potential to evolve as true innovation districts? This question poses a reflection on whether the planning of innovation districts from scratch is an effective approach to spur growth in cities instead of supporting the evolution of places where productive activities can flourish. The so-called ‘The Hague Central Innovation District (CID)’ -presented at this meeting- seems to be an interesting example to discuss the effectiveness of such approach. The Hague’s CID is a blurry area sketched between the city’s railway stations (i.e. DH Holland Spoor, DH Central Station and DH Lan Van NOI). These three nodes are deliberately targeted to renew the city’s economy into a knowledge-based one, and to enhance the already well-know international climate of the city. The stronger presence of Leiden University in one of these nodes and the transport infrastructure seems to play an important role connecting The Hague’s CID with other regional and international knowledge networks in Leiden, Delft, Rotterdam, Brussels and Paris. Beyond this, the development of the area remains unclear regarding the precise municipality’s ambitions on innovation and the roles of the organisations and the residents already established in this area. Certainly, there are a significant number of organisations in the area but how they will renew the city’s economy is unclear. This is important because they are very diverse institutions (including several ministries and public institutions, service companies and diverse higher education institutions) whose interests and perceptions on innovation may be different. Additionally, this blurry triangle demarcated by the three railways stations spans over four neighbourhoods with very different residents, activities and spatial qualities (i.e. Centrum, Stationsbuurt, Bezuidenhout, and Binckhorst). Clearly, this could be another example in which the label ‘Innovation’ brings together economic- and urban regeneration goals. However, can everyone benefit from innovation using this cherry-picking approach? These aspects can be illustrated with the case of Kendall Square in Cambridge (U.S.), a successful innovation district (Katz and Wagner, 2014), which Flavia Curvelo Magdaniel documented as part of a case study of her doctoral thesis on campus development stimulating innovation (Curvelo Magdaniel, 2016). This area, adjacent to- and part of the MIT campus, has been on development since 1968. First, multiple parties (public and private) organised themselves to plan, build and manage this area, which was proposed as an urban renewal strategy to clear its old industrial use. Second, the area have clustered firms and institutes working in related and complementary fields, which have evolved over the years in line with periods of technological advancements in Massachusetts (i.e. from electronics and hardware in the 1960s-1970s, software and networks in the 1980s-1990s, to life sciences and IT business in the 2000s- to date). Third, the parties involved played particular roles in changing the one industrial identity of the area using their anchor institutions as an advantage (i.e. the long-term established higher education institutes and their spin-outs). Fourth, the urban renewal strategy focused on supporting economic goals (not spatial ones) after critical re-industrialisation periods. Fifth, the region has a long entrepreneurial tradition, which has been excelled in the area by organising activities that bringing together a network of leaders, venture capitalists, researchers and officials. 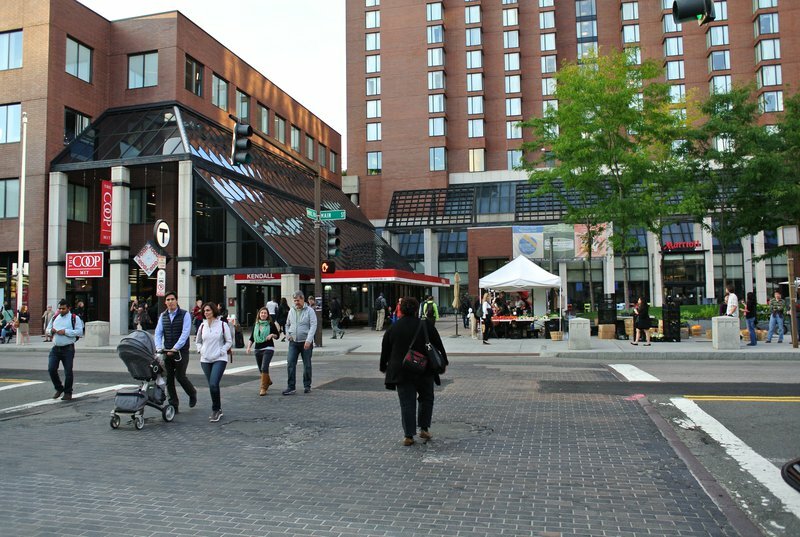 Sixth, the relationship between the university and the city strengthened over the years since the university has played an active role in the urban development of East Cambridge. Last, the lack of an explicit innovation policy but a motto that promotes the stimulation of innovation has helped to focus the attention of all the parties involved, which have benefited in different ways from the clustering of activities in Kendall Square. Despite its success, this case is also dealing with the issue of inclusiveness. Indeed, the different ways in which various parties benefit from innovation brings also some issues for the future development of this area, such as affordability of housing and supporting functions and traffic congestion. Although universities, municipalities, research institutes and firms share the goal of stimulating innovation, stakeholders within these organisations perceive innovation differently. In Kendall Square, Curvelo Magdaniel identified two main perceptions on innovation influencing the facilitating role of urban development. On the one hand, stakeholders who perceive innovation as a process driven by the exchange of ideas seek to facilitate people’s activities. On the other hand, stakeholders who perceive innovation as market driven by the exchange of capital seek to maximise profits from the presence of innovative organisations (Curvelo Magdaniel, 2016). An increasing focus on the last perception may result in rise of land prices and real estate value but also gentrification. Balancing the different stakeholders’ interests is a learning point in order to retain diverse users of these areas such as students, small entrepreneurs and service firms in the large innovation chain. Delft University of Technology is exploring these and other aspects to improve the current understanding of innovation districts in the European context. ‘Urban Innovation Districts (UID)’ has been introduced as a new theme in the graduation laboratory of the master track Management in the Built environment (TU-Delft, 2017). Currently, masters’ students are investigating the drivers, models, strategies, success factors and policy implications of innovation districts by studying European cases. Policy makers, developers and urban planners interested in developing these areas can use this knowledge. In the Netherlands, this could be particularly interesting for the municipalities of The Hague and Rotterdam, which has already launched their innovation district strategy. CURVELO MAGDANIEL, F. T. J. 2016. Technology campuses and cities. A study on the relation between innovation and the built environment at the urban area level. PhD Doctoral thesis, Delft University of Technology. KATZ, B. & WAGNER, J. 2014. The Rise of Innovation Districts: A New Geography of Innovation in America. Metropolitan Policy Program. Washington: Brookings. TU-DELFT 2017. MBE Graduation Laboratory AR3R010 Course Book 2016 - 2017. Delft University of Technology.